Silverberries are a type of berry grown between the months of May and June that are eaten in the same manner as cherries, whole without removing skin. Silverberry jam and juice as you would expect can be made from silverberries. 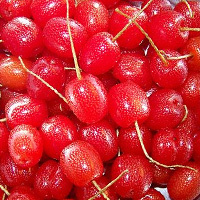 It serves as a good source of vitamin E said to have an antiaging effect in your body. The calories in Silverberries per 18g(10pieces edible part) is 12 calories. Silverberries is calculated to be 68Cal per 100 grams making 80Cal equivalent to 117.65g with 3.1g of mostly carbohydrates、0.23g of protein、0.04g of fat in 18g while being rich in vitamins and minerals such as Vitamin E Alpha Tocopherol and Copper.